While D’SCENE magazine team was shaping the moodboard for our Bottega Veneta Fall Winter 2016 collection shoot we knew the location must have both modern and elegant charm. Thankfully we found the sentiment close to the designer Tomas Maier’s view of his collection at the stunning Casa Ranieri-Tenti in Milano. Located at via Borgo Nuovo, the city’s most exclusive street today, this striking family home turned boutique hotel is a true testament of Milan’s past. Today the house is part of Hemeras Boutique House (HBH), the first Network Boutique Hotel in the heart of Milano, located near the Duomo, the Milan fashion district and surrounded by the newly constructed skyscrapers, a variety of exclusive locations designed to offer the comfort of the best hotels and the privacy of an apartment and the major tourist attractions of the city. The striking Casa Ranieri Tenti, has been owned by the family Alvise Ranieri-Tenti for over two centuries and 450 years ago it was inhabited by two families, as reflected in the chronicles of the time. The house is a true part of HBH philosophy which embodies the new concept of a Network Hotel, promotes the destination, appreciates the best of local businesses (luxury shops, restaurants, cafes, disco clubs, gyms) and offers a unique experience of the city to exclusive international clients. Each Boutique House in the HBH family is beautifully furnished, in order to ensure their guests a pleasant and comfortable stay. The chain offers the perfect combination of comfort and luxury typically associated with high-end hotels and the intimacy that only a private residence can provide. In addition to the Casa Ranieri Tenti, HBH owns numerous apartments located in the heart of Milan, their reception is open 7 days a week, and is be ready to receive guests in Via delle Asole 4, few steps far from Duomo. HBH is just a short walk away from the main sights and attractions offered by the capital of fashion such as Piazza del Duomo, Galleria Vittorio Emanuele, Teatro Alla Scala, Via Montenapoleone, Piazza Affari, Pinacoteca di Brera, Castello Sforzesco and Stazione Centrale. 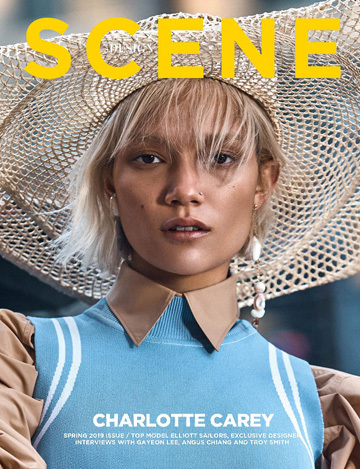 Don’t miss our eye-catching session from the Casa Ranieri-Teni (pages 83-89) captured by Fashion Photography duo Amilcare & Alex and D’SCENE Magazine’s Milan Fashion Editor Emily Lee.